British imperialist rulers aimed to prove the ethnic pre-eminence of their race. In response, indentured labourers arriving in Natal as part of the Indian diaspora established and developed their own ethical standpoint. By analysing historical and literary elements, it is possible to trace the emergence of a critical identity and ethical consciousness which were shaped by the experiences of the South African Indian diaspora community. Such identity is memorable and transferable to the country as a whole, and of considerable value in nurturing social/ist consciousness for countering current challenges of racism and materialist indifference. 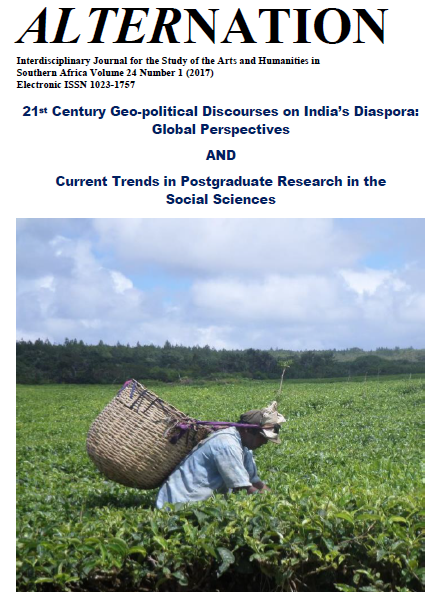 This paper falls into two broad sections, the first deals with the history and context of South African Indian diasporic writings; the second section deals with diaspora identity.